Slavery is real. But we can help end it! We're swimming to help end slavery. Did you know that today, there are more people living in slavery than at any other time in history? But there's good news: youth are becoming a part of changing that. We're raising money to end slavery—and we won't stop until we meet our goal. Want to help? 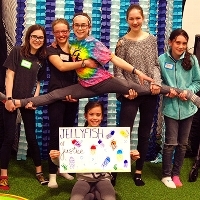 Support us by making a per-lap pledge for one of us, or by making a donation to International Justice Mission here on our Freedom Swim fundraising pages! The process is fast, easy and secure, and you can rest assured that your gift will help to bring people out of slavery and into restoration.